There is just something about the love a dog shows to his owner that cannot be matched. Dogs love, forgive, play, protect and sit by your side through thick and thin. These loving companions can however, bring fleas into your home. Fleas enter your home through your dog’s fur. The minute you notice these unwanted pests around your house in Minneapolis, MN, be sure to contact the professional flea extermination team at Eco Tech. Your Dog May be Allergic – Many dogs suffer from Flea Allergy Dermatitis (FAD). If your dog suffers from FAD, their skin will react to the flea bites and they may be allergic to the flea’s saliva as well. Signs that your dog may be allergic include constant itching and hives. Carry Disease – These pests can carry dangerous diseases that may not only affect your dog, but humans as well. Tapeworms are commonly associated with fleas. If your dog ingests a flea, tapeworm larva may enter into your pet’s gastrointestinal tract, causing tapeworms to develop. 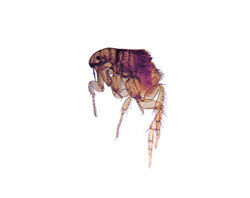 Fleas Affect Humans as Well – Once fleas enter your home, you are susceptible to their bites as well. Flea bites often cause itchy bumps or blisters on humans. Some individuals are more sensitive to these bites than others. Give us a Call – The minute you notice these fleas in your home, or you think your dog is itching more than normal, give Eco Tech a call! Let us Inspect – Once the call is made, a extermination specialist will arrive at your home ready to provide a thorough inspection in search of all fleas within your home. Time to Exterminate – Thanks to our all natural extermination products, your family and pets will not be in danger as there are no harmful chemicals. Quickly, we will exterminate these unwanted fleas! We Can Repair Too – If there is any damage caused by these fleas within your residence, we can fix any repairs as well! Prevention is Important – Some extermination professionals will leave once the extermination is complete, but not Eco Tech! We put preventative measures in place to ensure that these unwanted pests don’t return anytime soon! Enjoy the companionship that you share with your dog and never take them for granted. If you live in Minneapolis, MN and have noticed your dog scratching more frequently, fleas could be an issue. Give our experienced team at Eco Tech a call today at (763) 785-1414 and let us make your home flea free!